Established: 1957 Coimbatore, Tamil Nadu Phone: 091(422)2440241, 91(422)2435550.
ri Avinashilingam Home Science College for Women was established by the great patriot and educationist Dr.T.S.Avinashilingam under the auspices of the Avinashilingam Education Trust in 1957 with 45 students.The growth of the Institution has been carefully nurtured to its current heights by the world renowned educationist and nutritionist Chancellor Dr. Rajammal P. Devadas until she passed away in 2002. It was one of the eight colleges on which autonomy was conferred by the University of Madras in June 1978 and the first of the women's colleges to get this distinction. Autonomy gave the College scope for academic freedom for innovations in teaching and research. The Government of India declared Sri Avinashilingam Home Science College for Women ,and Sri Avinashilingam College of Education as a Deemed University under Section 3 of the UGC Act in June 1988. The college has been renamed as Avinashilingam Institute for Home Science and Higher Education for Women. The focus on the holistic development of students is carefully being channelized under the inspirational guidance of Thiru.T.K.Shanmuganandam, Chancellor and Hon. Col. Dr. Saroja Prabhakaran, Vice Chancellor of the University. The institute follows the educational ideals of Sri Ramakrishna, Holy Mother Sri Saradamani Devi, Swami Vivekananda and Mahatma Gandhi and upholds a life of purity, discipline and service. A temple dedicated to Sri Ramakrishna commands the campus. Daily prayer and worship are an integral part of campus life. All the students and staff are expected to participate in the common assembly prayers. The institute functions under seven Faculties, namely, Home Science, Science, Humanities, Education, Business Administration, Engineering and Community Education and Entrepreneurship Development, each faculty functioning under its respective Dean.The pattern of education has been fully semesterised. The academic year is divided into two semesters, each semester having a minimum of 100 working days. The semester pattern offers to each student, individual attention of the teacher and facilitates the student's all round development. It calls for active participation of the students in the learning process. It is imperative that today 's youth cultivate a sublime vision, a noble ambition because as our President A.P.J Abdul Kalam observes, ' Vision Ignites the Minds '. India needs visionaries of the stature of Mahatma Gandhi, Jawaharlal Nehru, J.R.D Tata, Vikram sarabhai and Dr.Verghese Kurien, to name a few, who can involve an entire generation in mission driven programmes which benefit the country as a whole' The country is in dire need of educated and service-minded and inspired youth who are ready to put the needs of the nation above everything else.' Knowledge is power ' - but mere acquisition of bookish knowledge devoid of application oriented skills will serve no purpose. Further, a developing nation like ours cannot afford depletion of the abundant national resources and human resources. The future of the country lies in the hands of the students.The exhaustive energy of the youth both men and women physical, mental and intellectual has to be channelised towards nation-building activities. Women should be encouraged to participate more actively in all phases of development activity, because the key to sustainable development lies in the empowerment of women, If women continue to be sidelined, then the nation would be deprived of the services of one half of the country's human resources. 1. Government of India Adi-Dravida Welfare Residential and Non-Residential Scholarships to students, provided heir parents’ income is less than Rs.2,50,000/- per annum. 2. Backward Class Scholarships to students whose parents' income is below Rs.2,00,000/- per annum. Note : Students will be eligible and recommended for any of these scholarships only if they put in the statutory minimum of attendance for scholarships (i.e 75%) and if they do not participate in undesirable activities. 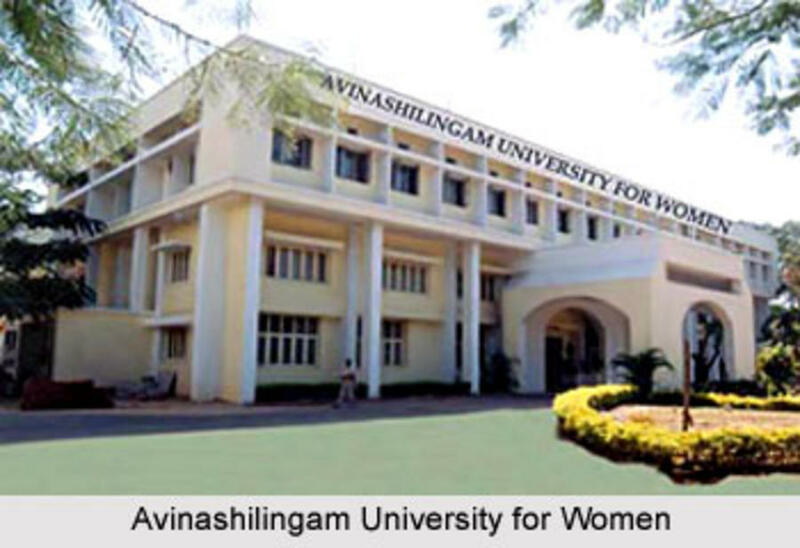 Avinashilingam Deemed University for Women, Coimbatore has 1 affiliated Colleges. Click here to explore them. Avinashilingam Deemed University for Women, Coimbatore has 31 Departments listed that offer various academic courses. Library is the power house of our University. Library caters to the research and teaching activities of institutions. It collects, manages and disseminates the information to its users according to their need. Library is situated in the heart of the campus incorporating the modern technologies so as to provide the readers right information at the right time. The automation work gained momentum with accuracy by the provision of assistance from INFLIBNET provided by the UGC to the university in 1996. Our university is identified by the UGC for library automation and networking in 1997-98 under INFLIBNET programme. Library is a part of the fibre optic based campus LAN. The library has its own sub LAN consisting of 27 terminals , two servers to support library software, OPAC services and other in-house computerization activities within the library. Computers with access to library resources and Internet are available. Library has procured SOUL software developed by INFLIBNET. It has been actively participating with INFLIBNET by contributing data to their databases. Databases for books, journals and theses were created. The database for serial holdings is under progress. Web Based OPAC has been created for more than 1.35 lakhs documents available in the library. The Library Catalogues can be searched and accessed from various departments through Intranet facility. Data can be accessed from various search points. Expenditure details of books purchased by various departments along with the online catalogue is also provided to the respective departments through Intranet facility. There are six hostels Kalaimagal Illam, Thirumagal Illam , Malaimagal Illam, Malarmagal Illam , Arpana Illam and Sarada Illam (New Hostel) with modern amenities and conveniences. There is a separate building to house the postgraduate students and staff. Catering in the hostel is vegetarian. The mess is run on the dividing system. Saradhalaya Canteen offers delicious, healthy & nutritious meals for the students and the staff of the university. This is run on a non profit basis with welfare motive. The hospitality is extended to all University functions and conventions and meetings. The students of the Food science management and Dietetics department are given practical exposure for quantity food production at the canteen. The Computer centre was established in the year 1991, with financial grant from UGC, to augment the computing facility to the MCA and M.Sc. Computer Science students and to provide additional support to the computer related activities of the University. The Computer entre extends support facilities to all the departments of the University and ensures optimal utilization of Computer facility and the free time is made available to the students and staff of the University. The University computer centre remains open to the staff and the students throughout the week. The University has two auditoriums with modern facilities. The Swami Vivekananda auditorium accommodates 500 members and the Thiruchitrambalam auditorium has a capacity to seat over 2000 members. Are you Interested in studying at Avinashilingam Deemed University for Women, Coimbatore?